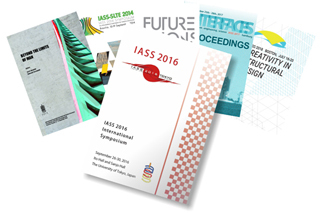 The Association publishes the Proceedings of IASS Annual Symposia in an electronic edition only (ISSN 2518-6582). These proceedings include the text of all the full papers presented at each year's symposium. Paper topics are typically related to the theme of the symposium and more generally to the design, analysis construction and other aspects of the technology of all types of shell and spatial structures. Typically, each IASS working group organizes one or more sessions at each symposium, while additional sessions are assembled by the symposium organizers. The organizers also invite distinguished plenary speakers, and if these speakers provide written papers, they are included in the proceedings. The Proceedings of IASS Annual Symposia are hosted by Ingenta Connect and include all annual volumes from Volume 2013 for IASS 2013 (Wroclaw, Poland) forward, listed in reverse chronological order. This collection is continually "under construction" and is enlarged on an annual basis by uploading the proceedings of the most recent symposium as soon as they are available after the conference. Papers in the proceedings contain original material and are reviewed and selected by the Scientific or Technical Committee of the respective symposium. The many sessions are grouped into fewer thematic sessions for online publication, where the thematic session names serve as the organizing basis of the table of contents. For full details about the editorial policies, including a statement of publication ethics, see the separate page entitled Proceedings Policies. All categories of members of the IASS automatically have full access to the Proceedings, including the ability to view and print PDFs of the full articles. For members, full online access to the proceedings is at the Publications Gateway for IASS Members (access requires login). The Association does not offer paid subscriptions to the Proceedings of IASS Annual Symposia. Those interested are instead urged to join the IASS and/or to attend one or more of the annual symposia.